Communication is a human right but there are 23,000 people in the UK alone who are literally silenced by lack of access to assistive technology. Whilst expensive solutions exist for people who need technology to communicate, AzuleJoe is the first open-source option that is free at the point of delivery. Our very first demo, is here. The archive of blog posts related to AzuleJoe’s history and development is here. Information about the default pageset, Communikate, is here. Joe’s little brother Richard has communication disabilities that mean he has never been able to speak. Until he was 19, his family managed to communicate with him using fewer than 100 signs. At 19 he received a Voice Output Communication Aid (VOCA). Richard’s VOCA has a simple set of folders and icons. If you press the folder for animal and then press the picture of the dog, the VOCA will say “dog”. Now Richard can use hundreds of words and it’s not just Joe and his mum and dad who can understand him: it’s everybody. The VOCA changed his life. But he’s not alone. Globally, tens of millions of people are in the same situation as Richard. Existing solutions are either too expensive, too unreliable or too difficult to maintain to meet the worldwide need. Our solution addresses these issues with an effective open-source solution that uses a training model rather than a hardware one. Approximately 32,000 people in the UK would benefit from using a VOCA system but only 8,900 (28%) can access one. This leaves 23,000 people without a voice, which has a major impact on their independence and quality of life. The main barrier is that VOCA cost an average of £2000. NHS trusts and local authorities in the UK spent an estimated £40million on VOCA equipment between 2006 and 2012. Long waiting and repair times are extremely common. Currently 40% of VOCA devices require repair in the first year of use. A VOCA system generated by AzuleJoe is available to use instantly online, without charge. It can also be downloaded so that it can be used without an internet connection. This makes the software ‘voice’ immediately available to users who have been restricted by cost. Even when users have access to a VOCA, existing systems are difficult to use. 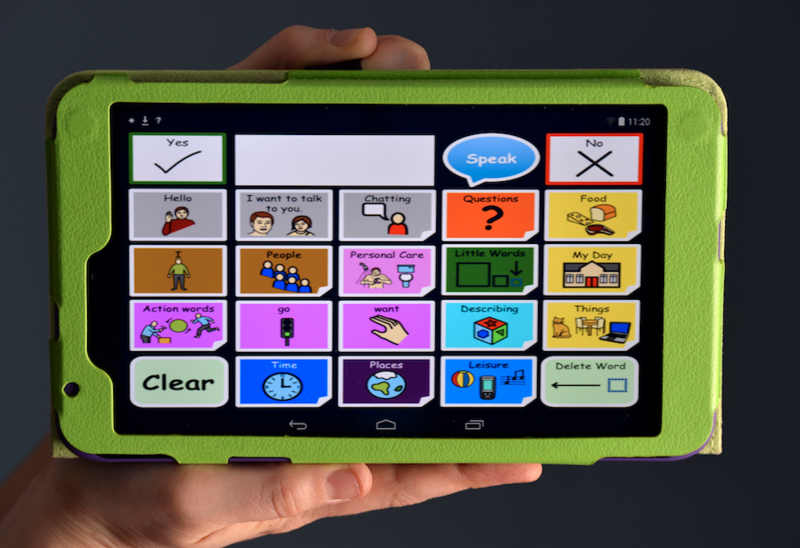 Care staff typically have very low IT-literacy and editing the content on existing VOCA devices is difficult, time consuming, and requires direct access to the device. The combination of the expense of the device and the difficulty of using VOCA editing software means that many care staff, even those with relatively high IT-literacy, avoid making changes (such as updating simple things like ‘favourite TV characters’ and the names of the VOCA-user’s friends) for fear of breaking the device. AzuleJoe allows care staff to specify VOCA content and layout using PowerPoint, rather than through a complex device-based system. As PowerPoint is a well-known piece of software, care staff are much more comfortable making changes than they are on a propriety piece of VOCA editing software. 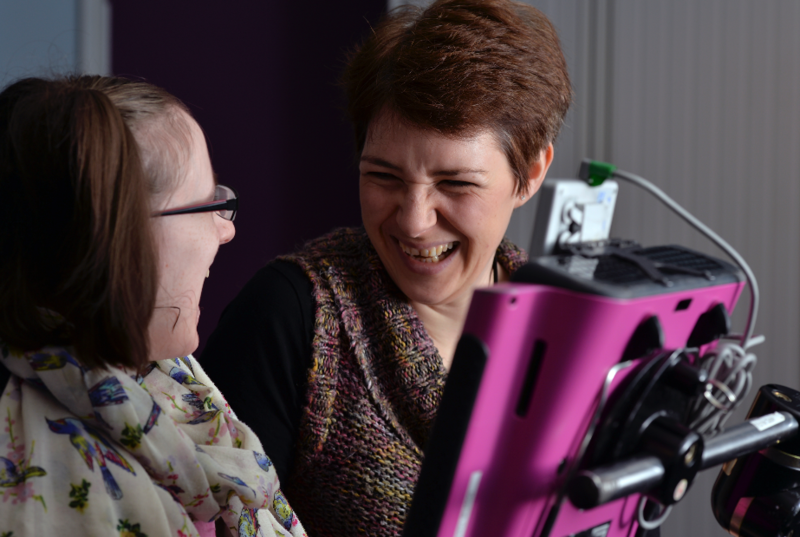 Care staff with low levels of technical skill can be much more confident that they won’t accidently ‘break’ the device, particularly as it is clear to them that the process is ‘safe’ until the content is uploaded to AzuleJoe. During the focus-groups we ran with care staff and therapists there was unanimous approval for the approach of using PowerPoint as the editing software rather than existing systems. Our solution allows users to generate their own VOCA system by uploading their own customised pageset to AzuleJoe in a simple PowerPoint template. To setup a new VOCA, a care worker downloads one of the CommuniKate PowerPoint templates and customises it for the user. For example, adding details of their name, age, names of their friends and family etc. They then upload the file to AzuleJoe, which will produce a web-based VOCA. The generated web based VOCA can then either be downloaded to a user’s device or used directly as a web app. This web app can be viewed on any internet-connected platform from a tablet to a laptop to a Kindle, without installation or any setup. To add or edit information on the VOCA, a care worker can change the PowerPoint directly and re-upload it, without risk of losing information or causing later problems. This means care workers can be much more confident in updating pagesets and keeping the vocabulary current. Moreover, this can be done ‘asynchronously’ – a user can still be communicating with their VOCA while maintenance is happening. 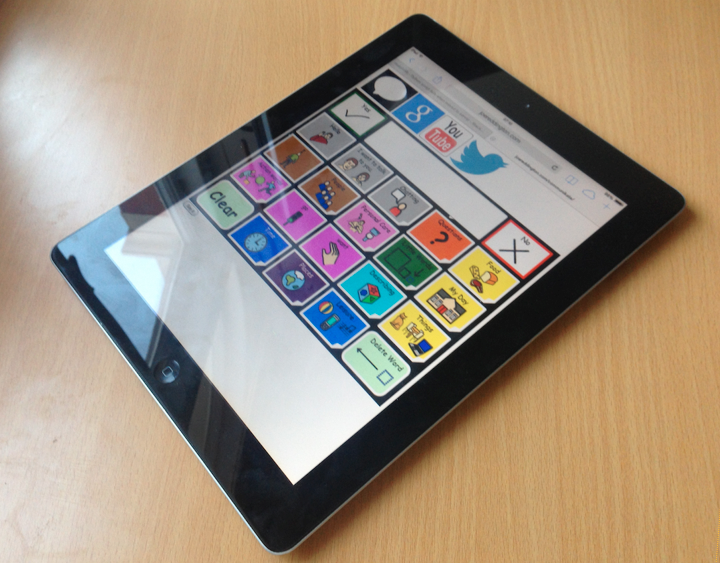 To deal with a broken piece of hardware – a care worker can simply open the relevant link on a new or spare tablet. There is no downtime while repairs are carried out. Many care workers are overstretched, and some teams see considerable staff turnover. AzuleJoe allows the person updating the device to be many miles away, such as a family member or friend. This upload-and-use model directly solves the key issues with existing VOCA systems and supply. 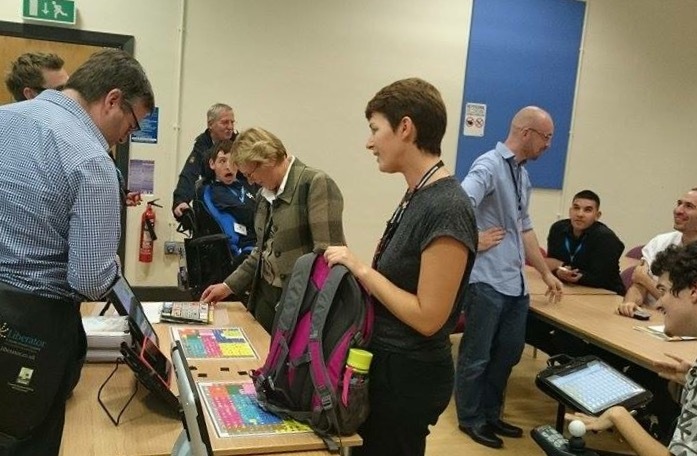 It provides an instant ‘wow factor’ for people within the assistive technology community and has proved highly desirable during our user-testing for its ease of use. A key part of our design ethos is to provide much easier customisation for a user compared to existing technologies. Reddington J. The Domesday dataset Linked open data in disability studies. Journal of Intellectual Disabilities. 2013 Jun 1;17(2):107-21. Shepherd, Tracy A., et al. “Reliability of speech generating devices: A 5-year review.” Augmentative and alternative communication 25.3 (2009): 145-153. “Shining a Light on AAC”, Communication Matters, 2013, http://goo.gl/8OQuTr. 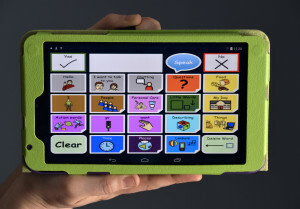 The web app can be any internet-enabled device – allowing users access to the ‘stylish’ tablets and phones that were discussed in the user testing.